Lean and Hot diet pills are the hottest diet pills available and have the best diet pill reviews. 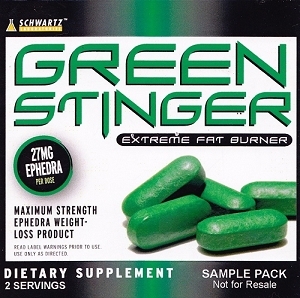 Lean & Hot with ephedra is manufactured by Schwartz Labs, the makers of Green Stinger. Feel greater than ever with more energy, suppressed appetite, increased metabolism, and added benefits of antioxidants with Lean and Hot diet pills. This remarkable new weight loss supplement can give your body the transformation you have been looking for. Lean & Hot's thermogenic effects work by allowing your body to burn more calories effectively all day long, even at rest. If you take Lean & Hot with ephedra, along with a healthy diet and exercise, you will see results immediately! 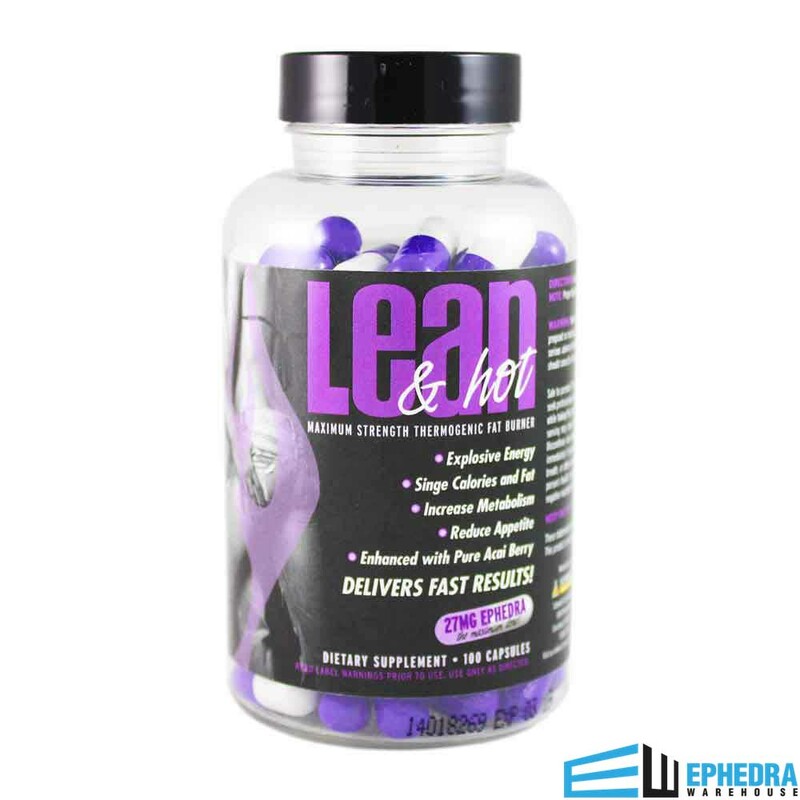 Lean and Hot ephedra diet pills have 27 mg of ephedra and 1000 mg of the cleansing acai berry. Lean & Hot also contains caffeine, white willow bark, synephrine, and many other proven weight loss promoting ingredients. This thermogenic fat burner is a fantastic ECA stack (ephedra, caffeine, and aspirin pound shedding combination) with the added benefits of the wonder antioxidant acai. The acai berry is widely known as a major "superfood" for its exceptional weight loss and age fighting properties. The acai berry is native to Central and South America, and is a small purple berry that looks similar to a blueberry. The acai berry helps to neutralize free radicals and aids your body in fighting disease and aging (1). Lean and Hot reviews are a big help to other customers considering buying Lean and Hot diet pills and trying Lean & Hot for themselves. We greatly appreciate all the feedback we do get for Lean & Hot reviews. We love to know which products are our customer's favorite diet pills, and we regularly run discounts on the most popular diet pills. Please write a Lean & Hot review and let us know how you like this product. 1. Venables M, Hulston C, Cox H, Jeukendrup A. Green tea extract ingestion, fat oxidation, and glucose tolerance in healthy humans. Am J Clin Nutr. 2008 March; 87(3); 778-84. I love Lean & Hot even more than Green Stinger! NO jitters with more than enough boost to rock out my workout! I like the capsule form of Lean & Hot better than the pressed-pill form of Green Stinger and the naturally healthy ingredients like acai berry. Using this product has effectively DOUBLED my weekly weight loss (from 1.5 lbs to 3 lbs weekly). If you are new to ephedra and don't want to feel cracked out but boosted and happy instead I would definitely suggest this product. My husband and I both have recently tried this product and both really like it. I feel very energetic and it really does suppress your appetite! The product lives up to its claims. I already feel like I have dropped some pounds!!! This product is amazing. It gives me energy plus without the jitters. It is one of my favorite ephedra products! I have used this product for about a week. Like the appetite suppressent and the boost. Didn't like that you have to take 2 pills to get a full serving. Lipodrene is a better value and got as much boost from half a tablet. No jitters or buzz from this product though and was able to sleep fine. I was disappointed by my results from this product. I was really hoping to get some good appetite suppression out of LEAN & HOT but sadly I got none. I currently take 3 pills upon waking and 2 in the afternoon(almost done with the bottle, ready to try something better) I workout 6 days a week but have major eating problems(love to eat anything and everything) The only thing that I liked about this product was that there was no jittery feelings/noticeable side effects. I love this diet pill. It has just the perfect amount of ephedra. 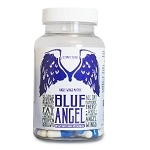 Most diet pills make me feel shaky but Lean and Hot keeps me energized and my mood elevated. Its also nice to know that the acai is giving me cleanse. Okay I admit I have always been skinny with a high metabolism and never had to worry about my weight. Well my son was born June 12 and I have been dieting and exercising to try to loose the weight. I ordered Lean & Hot a couple of weeks ago and I can tell already that I am loosing weight faster. I feel skinnier! I don't feel like eating all day, and I have the energy and motivation to go to the gym. LOVE this stuff! I'm completely happy with Lean and Hot! I feel great, have stamina and energy, with no side effects. I've already lost 6 lbs., averaging 3 lbs. a week... Thanks guys! A+++++++GETS ME UP IN THE MORNING.GOOD FOCUS,CLEAN ENERGY,READY TO HIT THE GYM. I really haven't noticed any weight loss from this product. It does keep me feeling awake which I could probably get from a few cups of coffee, but coffee makes me jittery and this product does not. I am on my second bottle. Nice balance of ephedra and caffeine. I have never have enjoyed products that make me feel to jittery. I would say that this is the least jittery fat burner from Schwartz Labs. Green Stinger Ephedra would be there next step up. I take Green Stinger before I hit the gym to give me energy to the extra mile. 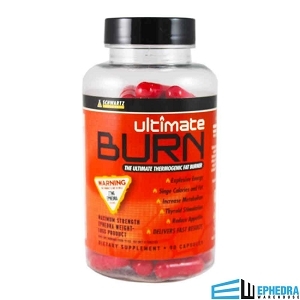 I tried Ultimate Burn a few months back it was really strong and effective, but to strong of an ephedra product for me. Good Luck! I ordered this about a month ago when you guys started selling it, and I have lost 5 pounds. I have been doing the same workouts and eating the same generally healthy foods, so I really think this has helped me loose the weight. Thanks! I tried this product because one of the representatives told me that it was new...I was skeptical at first but once I got it and gave it a shot I really liked it. Gave me a little extra energy, I lost 8 lbs, and wasn't as hungry. Overall I give it a 5. This pill is not what I expected. 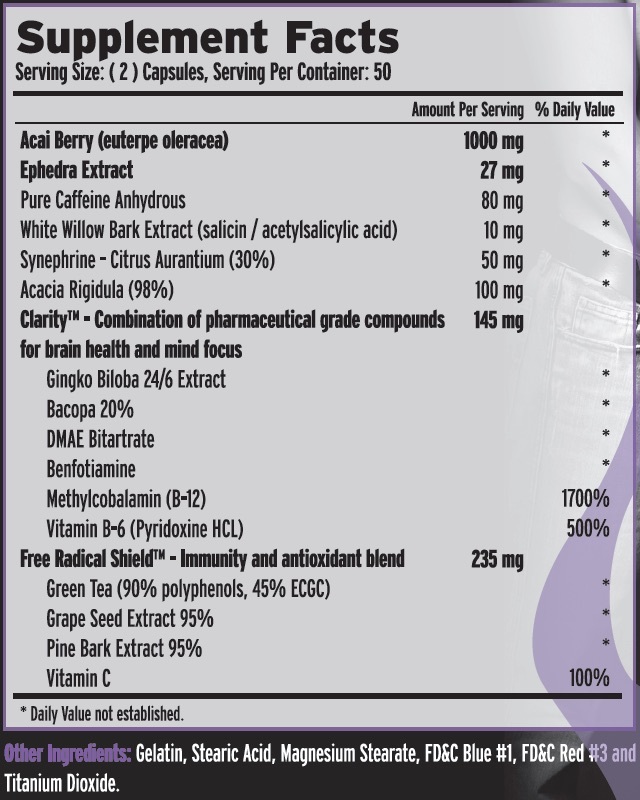 I have been taking it for 3 weeks not & have not experienced the appetite supressing or an increase in energy. These are the two main things I look for in a supplement as they help to control my hunger & give me the energy to get through my workout. I did notice that they helped me maintain my weight through a weekend of bad eating since family was in town, but that is really the only good thing I can say about this.